This Food Memory is from Joanne of Inspired Taste. She sent me the recipe right before Thanksgiving, which was inspired because I needed a serious infusion of vegetables into my diet after pigging out on turkey day. This soup was easy to fix which was exactly what I needed on what turned out to be a busy day in the kitchen. Thanks Joanne for helping to lighten my load. When I was younger my mother made a lot of soup. Both of my parents worked during the day and one of her favorite meals was to make soup for us for dinner; she would make all kinds of soups (her favorite was leek and potato). Now that I have my own kitchen, I have found that I too make lots of soups. If there was one soup that Adam and I can always go for, it’s this recipe for vegetable soup. We just love it, I think we have actually had it 3 nights in a row before. It is very simple and inexpensive, which we love. Ever since Adam and I moved into our condo together, we always try to spend as much time together as possible. Obviously, I love to cook and spend a lot of time in the kitchen, but sometimes, I just get so caught up in a recipe, while both Adam and I are home, we don’t actually spend any time together. Of course we both love the outcome of hours in the kitchen, but sometimes we just want to spend time together (but still have an awesome meal). Making this soup is the perfect combination of an awesome and wholesome dinner, an opportunity to spend a little time in the kitchen, Adam has time to set up the blankets and wine and we get to spend the rest of the night together on the sofa, oh, and there is very little cleanup. Cut the carrots, onions and celery into 1/2 inch cubes, then put them into a large soup pot with the olive oil over medium-high heat. Sprinkle the vegetables with about 1/4 teaspoon salt and 1/8 teaspoon pepper, then cook for 5 minutes. While the vegetables are cooking, peel and cut the potatoes into 1/2 inch cubes. After the 5 minutes, add the halved garlic to the pot as well as the potatoes, then cook for another 5 minutes. BAH Note: Joanne said not mincing the garlic allows for a more “mellow” garlic flavor in the soup and she couldn’t have been more right about that. You’ll taste the garlic, but in all the right ways. Add the bay leaf, thyme and chicken stock and bring to a boil, reduce the heat and simmer for 20 minutes or until all the vegetables are cooked through. Remove the soup from the heat. Take out the bay leaf and thyme stems (the leaves will fall off the stem during cooking). Pour the soup into a blender and blend until your desired consistency, I personally like this soup pretty smooth. Pour the blended soup back into the soup pot, add the cream season to taste and heat through, but do not boil. BAH Note: I used additional chicken broth instead of cream in the soup. You use what you have or like best. This does sound like the perfect soup. Hope you are doing well, Wendi. Thanks Tracy. I’m thinking this soup would pair well with your gemelli and ricotta sauce. That would be such a great meal on a dreary, wet weeknight. Thanks Tracy. The Mistah and I really liked this soup. I’m taking the recipe with me down to Florida and might make it for the ‘rents. Who am I kidding? Of course I’ll make it while I’m there. If they choose to eat it is entirely up to them. Wendi, I hope that soup brought you some comfort. It sounds very nourishing and healthy. Thinking of you. 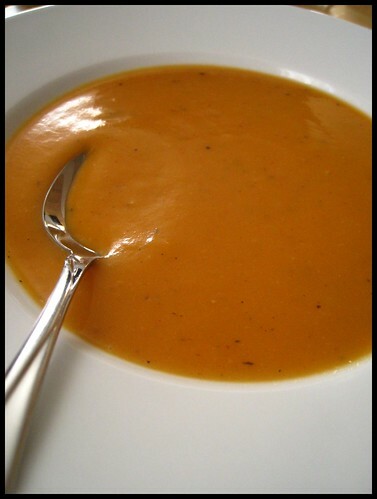 Still time for soup of any kind but this smooth vegetable soup sounds wonderful. We all know that half and half is my new best friend. Emily, half and half, cream, I have special relationships with all of them. This soup is a great way to clean out the lonely vegetables that have been hanging out in your crisper drawer. Thanks for the well wishes. Taking each day as it comes and hoping for the best. This sounds great (for me and my poor, lonely vegetables). Thanks, Joanne! Thanks, Wendi! J, lonely vegetables are made for this recipe. Or maybe this recipe is made for lonely vegetables. Think you can get the kids to try it? I made this today for dinner. I added just a touch of cumin ( southwest ya know) Gave it just a zing. One caveat. Might have just been my old blender. Might have had a hairline crack in the carafe. I took all precaution s when blending. Small batches, lid on tight but not too tight, towel over the top. what I did NOT count on wa the loud crack as the carafe flew into a million pieces on the third batch of soup. Was I surprised.\? Uh yeah! Maybe the immersion blender is going to be a better choice of weapon in this house at least. Exploding blenders are not fun. I usually do use my immersion blender and am generally pleased with the results. It stays maybe a little chunkier than with the regular blender but it doesn’t explode on you. Food IS fun Emily. I love my Kitchen Aid. At the time, I wasn’t sure it would be worth the money…it’s totally been worth every penny.